With February being American Heart Month, several businesses will be supporting the American Heart Association with donations or a percentage of sales going to the association. In addition, we encourage people to participate in National Wear Red Day on February 6 and wear red to promote awareness of heart disease in women. The February Art Walk will be held February 5th from 5:00 to 8:00 pm at the shops and galleries on Public Square, Franklin Street, and Strawberry Alley. The participating businesses are listed below as well as a description of the work they will be exhibiting and services they will be offering during the event. Downtown Artists Co-op (DAC) is proud to announce our 4th Annual Juried Photography Exhibition. This Photography Expo will feature the best photography from local and regional photographers. The DAC will be serving up delicious appetizers, punch and wine for the opening. The opening reception for the DAC Juried Photo Expo will be Thursday, February 5th from 5PM till 8PM. Awards and recognition will be given during the opening reception. Our primary sponsors for the DAC Annual Photo Expo are Regions Bank and Planters Bank. The DAC opening is a central part of Clarksville’s “First Thursday Art Walk”, a wonderful evening of art, music and more in beautiful Historic Downtown Clarksville. Clarksville’s Art Walk occurs regularly on the first Thursday of each month. As always, the DAC will be serving up delicious appetizers, punch, water and wine for the opening reception. The DAC Photo Expo will be on display during the entire month of February at the DAC Gallery located at 96 Franklin Street, Clarksville, TN. See our website or visit us on Facebook at https://www.facebook.com/pages/Downtown-Artists-Cooperative/120361884688000 for more information.All DAC openings and exhibits are also generously sponsored by The Frame Maker (Glen Edgin), F&M Bank and Sango Fine Wines and Spirits. Edward’s Steakhouse is proud to host local artist, Sandy Hart and local photographer, David Smith, during the February First Thursday ArtWalk. Sandy Hart has been a part of the Clarksville community since 1995. She has always enjoyed making handmade items but started to seriously pursue her love of art three years ago. Since then, she has been taking art classes in Nashville, TN and has participated in several local art shows and markets. Edward’s Steakhouse will host a variety of handmade items that include scarves, pottery, jewelry and zentangle. Stop in, see the art, listen to Denise Fuller on the piano and take in their Thursday night special, 1/2 priced $7.00 appetizers and 2 for 1 draft drink specials. 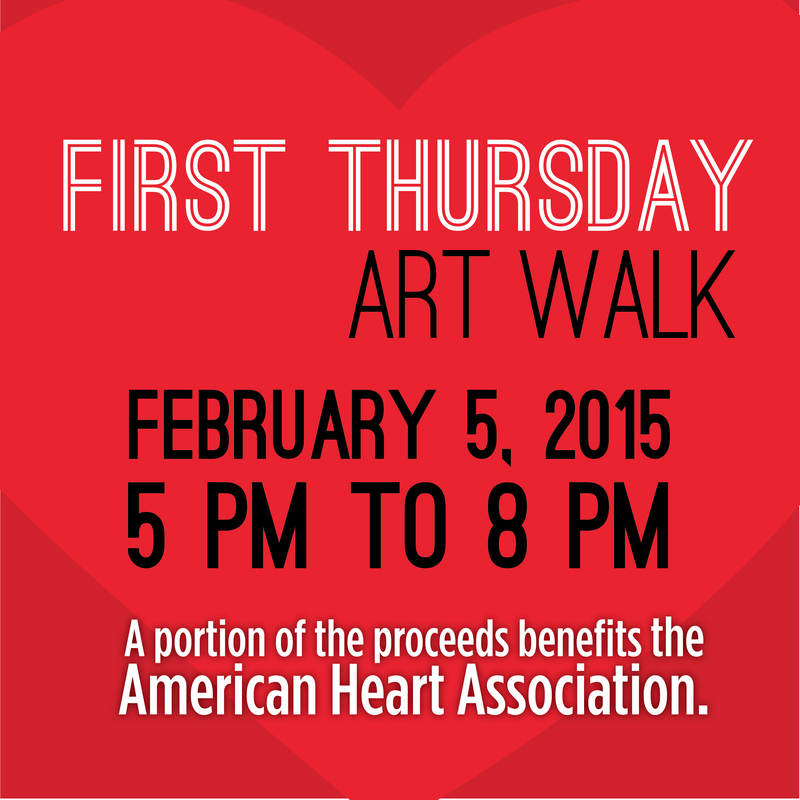 A percentage of all food sales during the First Thursday Art Walk will go to the American Heart Association. The Roxy Regional Theatre’s Peg Harvill Gallery will feature country music-themed posters from Nashville’s historic letterpress shop Hatch Show Print to accompany their upcoming production of the hilarious classic country musical HONKY TONK ANGELS, playing February 13 through March 7. Gallery hours during Art Walk will be 5:00pm – 8:00pm. Additional gallery hours are Monday through Friday, 9am – 2pm. For tickets to and information about our current productions of “Honky Tonk Angels” please visit www.roxyregionaltheatre.org or call the box office at 931.645.7699. The Customs House Museum will be open and free to the public during the February First Thursday Art Walk. The Customs House Museum will also donate 15% of that days store sales to the American Heart Association. There will also be 15% off valentines sale that night on Jewelry. Remember, museum members get an extra 5% off on jewelry too. The eclectic group of artists exhibiting in Right Before My Eyes: A Still Life Invitationalbrings a variety of interpretations within the still life theme. From the dark, moody arrangements of realist painter Matthew Gore to the loose, representational style of Mary Addison Hackett, the subject of still life is amply explored through various painting genres. Dodd’s work transports viewers into a surreal fantasy of contemporary stories within each work of art. His manipulated pieces could be considered a twenty-first century version of Pre-Raphaelite art; they appear more like romantic paintings than digital photographs. The Tennessee Civil War National Heritage Area’s traveling exhibition about emancipation and Reconstruction comes to the Customs House Museum. “Free at Last!” tells the momentous story of the transition from slavery to freedom and the development of citizenship among formerly enslaved African Americans as part of the 150th anniversary of the Civil War. The Nashville Artist Guild has created Divided Loyalties, a group of original works of art that commemorate the 150th anniversary of the Civil War. The Framemaker proudly presents “New Photographs by Jonathan Wheeler”. The exhibit is part of Clarksville’s First Thursday Art Walk on February 5, 2015. An opening reception will be held from 5 p.m. to 8 p.m. The artwork will remain on display at the Framemaker throughout the month of February during normal business hours (Mon. through Fri. 10 a.m. – 5 p.m.). Jonathan Wheeler is a Clarksville, Tennessee resident who recently graduated from Austin Peay State University with a Bachelor of Science in English and a concentration in art photography in the fall of 2013. His photography consist of many different mediums such as darkroom processes, cyanotypes, dry tintypes, solargraphy with the use of pinhole camera, lomography and digital photography. The Framemaker will also be donating a portion of their sales during the February First Thursday Art Walk to the American Heart Association. Rogate’s Boutique is proud to host local artist, Jennifer Suits for the February First Thursday Art Walk. Jennifer is a self-taught painter and have been painting for about four months. She has painted in the past but recently picked it back up for therapy. A farmer by profession, she realized that she enjoys other people’s artwork and that has inspired her to pick up the paint brush once again. She enjoys miniature painting, Egyptian hieroglyphs on papyrus paper and acrylic on stretched canvas, masonite, wood panel and canvas panels. Jennifer’s art subjects vary, ranging from nature scene to space nebulas. Impressionism and realism are her preferred styles. Rogate’s Boutique will also be supporting the American Heart Association during the February First Thursday Art Walk. Mildred and Mable’s will be open late during the February First Thursday Art Walk. Donations for the American Heart Association will be accepted from 5pm to 8pm that night. Stop in and see great ways to transition your wardrobe and home this winter and maybe pick up a Valentine’s Day gift or two! Couture Crush will stay open late for the February First Thursday Art Walk. Couture Crush will be taking donations for the American Heart Association from 5pm – 8pm that evening. Stop in and see all the great offerings and maybe pick your Valentine up something special!